Terminology: In this documentation, a user means a 'user or the api', which maps to the user credential passed through api. Assumptions: We assume the reader went through the Getting started documentation and has a running system (both killbill and kaui) running on IP=127.0.0.1. Each request to Kill Bill requires authentication. The authentication phase verifies that the user exists in the system and that its credentials are correct. Once the credentials have been validated, the roles associated to the user are then extracted, and then the set of permissions associated to each role are also retrieved. The credentials are passed in the request using http basic authentication mechanism. Kill Bill relies on shiro for the backend implementation. Note that the authentication/authorization is orthogonal to the tenant access: The set of permissions associated to a given user is the same for all tenants (for which he has the keys). So, a potential superuser with all the permissions and with access to the api_key/api_secret for all tenants would have full control of the entire system. It is common practise to create a cross-tenant admin with the ability to only manage tenants and nothing else, and then have one superadmin per tenant. The full list of available permissions can be found here. For simple deployments where only few static users/roles need to be assigned, the shiro.ini file is the simplest and the best option. By default both Kill Bill (shiro.ini) and Kaui ship with an admin user (and its password password) that has all the permissions. One can immediatly log-in to Kaui using such user, and start configuring tenants as needed. Changing such user (e.g to use superadmin) or password would require editing shiro.ini on the Kill Bill side to make sure this initial user can log-in to Kaui (see below). For a large entreprise solution, an LDAP integration is probably the most flexible. For cases where LDAP is not available, a good middle ground is to rely on a mixed solution between the shiro.ini file and the database backend. This is what the rest of this section will describe. The shiro.ini file is used to configure the initial user (could be a superadmin with all permissions or an admin with just enough permissions to manage the user/roles). For simplicity, we will call it superadmin and will assign one role containing all permissions. 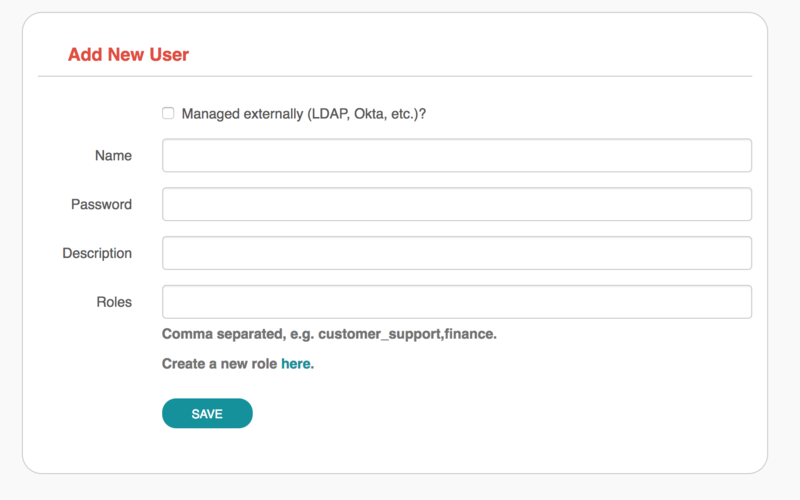 Once deployed, the 'superadmin' is now able to make api calls to configure new users/roles. You can use the property org.killbill.security.shiroResourcePath to specify the location of this file. When using Docker, you can bind mount the file, e.g. specify -v /path/to/shiro.ini:/var/lib/killbill/shiro.ini -e KILLBILL_SECURITY_SHIRO_RESOURCE_PATH=file:/var/lib/killbill/shiro.ini. Assuming our cs user knows about the api_key and api_secret of the tenant, he should now be able to make any api calls against that tenant (with the limitation of his permission set). KAUI has been extended to understand all the user/role/permission management and will manage the corresponding sessions. Some of those implementation details were covered in our previous blog post. Fields to populate will depend on which back-end realm is configured. If you are storing roles, usernames and passwords in the Kill Bill database, leave the "Managed externally" checkbox unchecked and fill-in all details. Kaui will create these users locally and in Kill Bill (if they don’t exist on the server already). Roles can be created by going to /role_definitions/new. If you are delegating roles and users management to a third-party system, Kaui only needs to know the login of the users. Password and roles being managed outside of Kill Bill, you need to access your third-party system to set and update these. Note that there is no auto-discovery of logins: you need to enter all logins from your system manually in Kaui before such users can access the UI (check the box "Managed externally" when adding these users). Kaui needs to be told about the relationship between user and tenants (this mapping is specific to the UI). The idea, is that a super admin would first configure the allowed users for each specific tenant on the KAUI side, in such a way that later on, when a specific user logs in, he only sees the tenants he has access to. This mapping can be configured by going to each user page (e.g. /admin_allowed_users/1). As far as tenant configuration goes, it is possible to create tenants directly from Kaui. If you already have created a tenant in Kill Bill using APIs, you can safely re-create it from Kaui, which will discover it on the server side and simply sync it locally. Kaui has the concept of a super user (root) for critical, cross-tenants, operations. By default, it assumes that the admin user is the super user, but you can change this by setting the system property kaui.root_username (KAUI_ROOT_USERNAME Docker environment variable). The password doesn’t need to be specified as it is stored on the server side (shiro.ini, etc. ).